Everest base camp trek is famous for its spectacular mountain peaks and the loyalty and friendliness of its inhabitants (the Sherpas). The Everest region (Khumbu) is one of the most popular destinations for tourists in Nepal. While many of the routes through the mountains are arduous, there are ample places to rest and enjoy a meal along the way. Everest base camp trek is the adventure of a lifetime, a journey for those whose dreams soar higher than the clouds. Miles away from cars, modern amenities, you'll saturate your spirit in natural beauty and stretch your personal endurance beyond what you thought possible. The path begins in ancient Kathmandu, where you'll acclimate and explore the city at your leisure while anticipating your ascent. 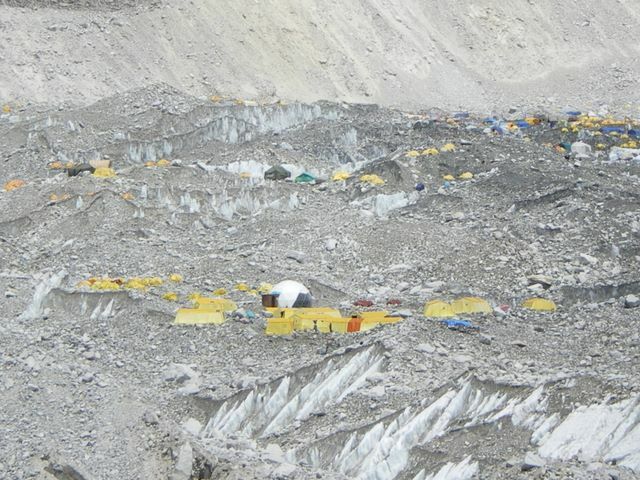 Your trek to Everest Base Camp at 5,364m (over 3.5 miles!) to the base of the world's tallest mountain will bring you over suspension bridges spanning chasms of thin air, through hidden Buddhist monasteries, and into the heart of the warm, rugged Sherpa culture. As you travel thrill seekers and photographers from all over the globe, you'll enjoy Cho Oyu, Lhotse, and Makalu - three of World's 10 tallest peaks! The accommodation and food supplies will be in cozy, traditional teahouses. Sharing with our experienced, knowledgeable guides. They will try their best to ensure the safest, most enjoyable, most fascinating experience possible. We'll support local economies, discover hidden strengths in yourself, and make both friends and memories that will last a lifetime. Eagle Treks and Expedition is one of the most professional agencies, as it takes good care of its valued customers. Trekking is possible in this area the whole year round, however the best times to visit are from the beginning of March to mid May and from the beginning of September to mid November. The winters are very cold and snow may make it difficult to travel higher than Tengboche. Summers, on the other hand, are wet, and the spectacular peaks often get lost in the clouds. April and early May is a good time to see the hedgerows and trees bursting into bloom, with rhododendrons, in particular, adding a spectacular splash of colour to the landscape. The views are much better after the summer monsoons have cleared the atmosphere of dust, but the days are shorter and cooler. Day 01: Welcome at Kathmandu airport and drive to Hotel, short briefing about the entire programs. Overnight at hotel with breakfast. Day 02: Preparation for Trekking. After the breakfast meet your tour guide and visit some heritage sites in Kathmandu. Overnight at hotel with breakfast. Day 03: Flight to Lukla 2880m from Kathmandu, trek to Phakding 2640m, approx 3 hours walk. The flight will be roughly 25-30 minutes to Lukla. Lukla airport is now named by Sir Edmund Hillary and this is the second busiest airport in Nepal. Your proper trek will start from here and first day will be gradual walk. We will descend almost 200m from Lukla. Little bit up and down and crossing bridge and walking through Dudhkoshi valley and local village. The beautiful view of Mt Kongde and KusumKangaru, Monastries along the way and beautiful landscape are main highlights of the day. Overnight at the lodge on full board. Day 04: Trek to Namche Bazar 3441m, approx 6-7 hours of walk. We will ascend almost 800m from Phakding. The first three hours will be quite similar as first day. Crossing bridge over the Dudhkoshi River (cross and re-cross), the beautiful views of Mt. Thamaserku, Kusum Kabgaro, some Mani walls and walking through the local villages will be just magnificent. Last two hours will be harder than first part. We can see more mountains and first view of Mt. Everest from along the way. Namche Bazar is the capital of Sherpas. Overnight at the lodge on full board. Day 05: Rest day in Namche Bazar. The rest day in Namche Bazzar is very relevant for safe acclimatization. Will take you around Namche Bazar to explore and go somewhere higher than Namche after breakfast and back to Namche. It is always better to climb higher and go lower to sleep while you are trekking above 3000m from sea level. Overnight at the lodge on full board. Day 06: Trek to Tyangboche 3880m, approx 5 hours of walk. We will ascend only 440m from Namche. First 20 minutes will be uphill then the trail will be really nice and easy for 1:30 hrs. You can see so many mountains (including Everest) and valley view which will be just amazing. The trail will be split to Gokyo valley and Base camp near Sanasa and we will take right down to Phungi Thanga. Last two hours walk from Phungi Thanga will be uphill to the Tyangboche. Overnight at the lodge on full board. Day 07: Trek to Dingboche 4360m, approx 5 hours of walk. We will ascend almost 500m from Tyangboche. First 30 minutes will be downhill then flat through the forest till bridge over the Imja Khola. The trail will be gradual up after the bridge. You don't see big trees from these days because you will be over 4000m and it called alpine zone. It will be nice walk through Imja Khola valley. Overnight at the lodge on full board. Day 08: Rest day in Dingboche. We will take you somewhere higher than Dingboche after breakfast and back to Dingboche. You will have plenty of time to explore around Dingboche and climb to Nangkartshang hill. Overnight at the lodge on full board. Day 09: Trek to Lobuche 4930m, approx 5-6 hours of walk. We will ascend more than 600m from Dingboche. The altitude will gain more and more and it is better to move slowly. The day begins with uphill for 15-20 minutes to the ridge and gradual up to the Thukla. You wil enjoy your walk with the beautiful scenery. From Thukla to the top will be the hardest part of the day. Steep uphill will be for about an hour more/less and you can see beautiful view from the pass. Then it will be gradual up to the Labuche. You can see spectacular sunset views over the Pumori and Nuptse. Overnight at the lodge on full board. 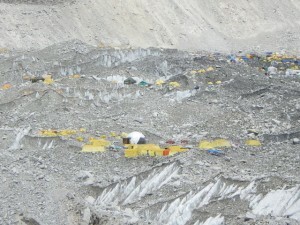 Day 10: Trek to Gorakshep 5170m, Everest Base camp 5365m and back to Gorakshep, approx 7-8 hoursl walk. This will be the important day because we are onwards to Everest Base camp today. “You should reach your goal!! !” We need to start quite earlier than other days because we need to walk long distance this day. It will be gradual up at the beginning and steep up somewhere but not too bad. The trail is little narrow and rocky somewhere. You can see nice views of mountains, valley and glacier. There is little bit downhill just before Gorakshep. We will stop at the lodge in Gorakshep and we will have our lunch then continue walk to EBC. The trail to EBC is little bit narrow and rocky little bit up/down. You can see beautiful view of Khumbu glacier and many mountains and it can be little bit windy so, make sure that you have warm cloths. We will spend our time at the EBC and back to Gorakshep. Overnight at the lodge on full board. Day 11: Climb to Kalapattar 5565m in the morning and down to Gorakshep and trek down to Pheriche after breakfast, approx 7-8 hours walk. This day is important too because we will go to Kalapattar in the morning and we starts to descend from this day. Wake up early in the morning and walk to Kalapattar then come down to Gorakshep. We will walk down to Pheriche from Gorakshep. We just follow the same way to Thukla and trail will split to Pheriche and Dingboche. It will be much easier to go down then going up. Overnight at the lodge on full board. Day 12: Trek to Phortse 3800m, approx 5-6 hours walk. Little bit flat at the beginning and down to stream to cross the bridge then little bit uphill to the top. After 20 minutes of walk from the top then starts to follow same way to go down to Pangboche. The trails split to Tyangboche and Phortse from here and we take right to go to Phortse. This trail will be little bit narrow then before not bad though, gradual/up/down. Overnight at the lodge on full board. Day 13: Trek to Khumjung 3790m, approx 4-5 hours walk. The day starts with downhill for 40 minutes and little bit gradual after the bridge. Then steep up to Mong-La for one hour more/less. Again downhill from the top and gradual up just before Khumjung. Overnight at the lodge on full board. Day 14: Trek to Phakding 2660m, approx 6-7 hours walk. Today your walk starts with uphill for 15-20 minutes and downhill to Namche through the Syangboche airstrip. Then we just follow same trail to Phakding from Namche. Overnight at the lodge on full board. Day 15: Trek to Lukla 2880m, approx 3 hours walk. We just follow same way to Lukla. It will be nice short day compare other previous days. This will be the last night in the mountain. Overnight at the lodge on full board. Day 16: Fly out from Lukla. We just need to walk little bit to get airport to catch the plane. You will reach Kathmandu after 25-30 minutes of flight. We will take you to the hotel and overnight at the hotel with breakfast. Day 17: Final departure to Kathmandu airport or further program according to flight schedule. * Note: The flight fare can change without prior notice. If changed the price will comes according to changed price.